Dr. Shiyan Zhang’s credentials | Chinese Acupuncture & Natural Therapy Center. Dr. Shiyan Zhang, L. Ac., O.M.D. 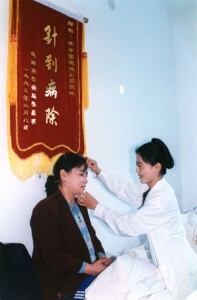 Dr. Zhang treats one of her patients. Note the banner that hangs in our offices. Dr. Zhang received her Doctorate Degree in Chinese Medicine at Liao Ning Traditional Chinese Medicine (TCM) University, one of the most respected in China. She completed both TCM and Western Medicine courses, and began working in 1994 as an acupuncturist and physician at Tie Ling City Traditional Chinese Medicine Hospital, where she was honored as an outstanding doctor for three consecutive years.